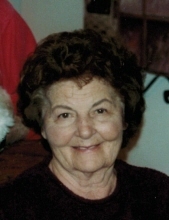 Mary Ventrello (nee Paveglio), 95, entered peacefully into eternity on February 1, 2019 while surrounded by her loving family. She was born April 17, 1923, daughter of the late Silvio and Elizabeth Paveglio and sister to the late Katherine (Elmer) Reynolds. She was married to her loving husband, Tony, of 72 years who preceded her in death on February 4, 2017. She is survived by her three daughters and son-in-laws, Karen (Orazio) Cristina, Toni Lynn (Jim) Pike and Debbie (Tom) Peterson. She was the proud grandmother of six grandchildren, Tracey (Matt) Malczyk, Amy Rogers, Beth (Eric) Elsen, Ryan (Andrea) Day, Joe (Heidi) Cristina, Kevin (Hannah) Day and 14 great-grandchildren, Brianna, Anthony M, Anthony J, Cristina, Alex, Mia, Joshua, Brooklyn, Makena, Olivia, Lillyana, Miles, Nolan and Kendall. Mary was cherished by extended family members, neice, Donna (Jerry) Bogue, nephews, Gregory, the late Larry Reynolds, Randy and the late Dean Scalzitti. Fond aunt of many nieces and nephews who will sadly miss her. Mary married the love of her life, Tony, on June 25, 1944 and was a devoted wife. Together they raised three daughters and enjoyed spending time with their grandchildren and great grandchildren. She was a dedicated mother first and foremost. Mary always said she was so fortunate to have three wonderful daughters. She treasured her children and embraced every moment with them. Mary was not only a devoted mother, but loved her role as “Grandma Toby”. She was a mentor, protector, best friend and always gave words of encouragement, wisdom and comfort. Mary truly was an inspiration to many because of the commitment and love she showed to Tony and her family. Mary lived a rich full life as a wonderful mother and homemaker. She kept an immaculate home, loved to cook and eagerly hosted Sunday and holiday dinners for her family. A few of her famous dishes were risotto, stuffed artichokes, calzones and homemade pasta and also had a flair for baking. Something Mary and Tony so much enjoyed and doing regularly was going for long car rides with their dog Toby. In addition, Mary enjoyed shopping, going to the movies, reading, dancing, singing and playing tune s on the player piano with her family and was a sharp Checkers and Razzle player. She truly was the beloved matriarch of her family. Mary took great pride in her children, grandchildren, and great-grandchildren. She was a strong support to her family and friends and was passionately dedicated to caring for her family to the end of her life. We will miss her loving, supportive, vivacious spirit and never forget her tenacity, wit, grace, generosity, and undying love. Mary will be missed and long remembered. In lieu of flowers, Donations to the Alzheimer's Assoc. www.alz.com would be appreciated. Funeral Mass will take place on Saturday, February 9, 2019 at 10:00 a.m. at St. Eugene Church 7958 W Foster Ave, Chicago, IL 60656. Committal Service will follow at St. Joseph Cemetery interment chapel. To send flowers or a remembrance gift to the family of Mary Ventrello, please visit our Tribute Store. "Email Address" would like to share the life celebration of Mary Ventrello. Click on the "link" to go to share a favorite memory or leave a condolence message for the family.